Rebecca (born 1958) works as executive secretary and takes care of the office of the Chairman of the board as his personal assistant. 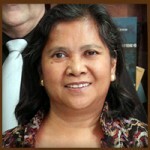 She is one of the founding members and serves on the board of directors since 1984. Previously she was employed by the Representative Office of HANIEL-KERN. A graduate with a Bachelor degree in Commerce and Marketing and started her career at the Bureau of Forest Development from 1980-1983. She loves travelling for business and leisure.